For the journal, see Arteriosclerosis (journal). Arteriosclerosis is the thickening, hardening, and loss of elasticity of the walls of arteries. This process gradually restricts the blood flow to one's organs and tissues and can lead to severe health risks brought on by atherosclerosis, which is a specific form of arteriosclerosis caused by the buildup of fatty plaques, cholesterol, and some other substances in and on the artery walls. It can be brought on by smoking, a bad diet, or many genetic factors. Atherosclerosis is the primary cause of coronary artery disease (CAD) and stroke, with multiple genetic and environmental contributions. Genetic-epidemiologic studies have identified a surprisingly long list of genetic and non-genetic risk factors for CAD. However, such studies indicate that family history is the most significant independent risk factor. The signs and symptoms of arteriosclerosis may include sudden weakness, facial or lower limb numbness, confusion, difficulty understanding speech, and problems seeing. The lesions of arteriosclerosis begin as the intima (innermost layer of blood vessel wall) of the arterial wall start to fill up with the deposition of cellular wastes. As these start to mature, they can take different forms of arteriosclerosis. All are linked through common features such as the stiffening of arterial vessels, thickening of arterial walls and degenerative nature of the disease. Arteriolosclerosis, unlike atherosclerosis, is a sclerosis that only affects small arteries and arterioles, which carry nutrients and blood to the cells. Atherosclerosis is the narrowing of arteries from a build up of plaque, usually made up of cholesterol, fatty substances, cellular waste products, calcium and fibrin, inside the arteries. This affects large and medium-sized arteries; however, its positioning varies person to person. Monckeberg's arteriosclerosis or medial calcific sclerosis is seen mostly in the elderly, commonly in arteries of the extremities. Hyperplastic: Hyperplastic arteriosclerosis refers to the type of arteriosclerosis that affects large and medium-sized arteries. Hyaline type: Hyaline arteriosclerosis, also referred to as arterial hyalinosis and arteriolar hyalinosis, refers to lesions that are caused by the deposition of homogenous hyaline in the small arteries and arterioles. Diagnosis of an individual suspected of having arteriosclerosis can be based on a physical exam, blood test, EKG and the results of these tests (among other exams). Treatment is often in the form of preventive measures of prophylaxis. Medical therapy is often prescribed to help prevent arteriosclerosis for underlying conditions, such as medications for the treatment of high cholesterol, medications to treat high blood pressure (e.g., ACE inhibitors), and antiplatelet medications. Lifestyle changes are also advised, such as increasing exercise, stopping smoking, and moderating alcohol intake. Angioplasty and stent placement: A catheter is first inserted into the blocked or narrowed part of the artery, followed by a second one with a deflated balloon which is passed through the catheter into the narrowed area. The balloon is then inflated, pushing the deposits back against the arterial walls, and then a mesh tube is usually left behind to prevent the artery from retightening. Coronary artery bypass surgery: This surgery creates a new pathway for blood to flow to the heart. The surgeon attaches a healthy piece of vein to the coronary artery, just above and below the blockage to allow bypass. Endarterectomy: This is the general procedure for the surgical removal of plaque from the artery that has become narrowed or blocked. Thrombolytic therapy: This is a treatment used to break up masses of plaque inside the arteries via intravenous clot-dissolving medicine. In 2008, the US had an estimate of 16 million atherosclerotic heart disease and 5.8 million strokes. Cardiovascular diseases that were caused by arteriosclerosis also caused almost 812,000 deaths in 2008, more than any other cause, including cancer. About 1.2 million Americans are predicted to have a heart attack each year. The diagnostics and clinical implications of this disease were not recognized until the 20th century. Many cases have been observed and recorded, and Jean Lobstein coined the term arteriosclerosis while he was analyzing the composition of calcified arterial lesions. The name comes from the Greek words ἀρτηρία (artēría, artery) and σκληρωτικός (sklērōtikós, hardened). 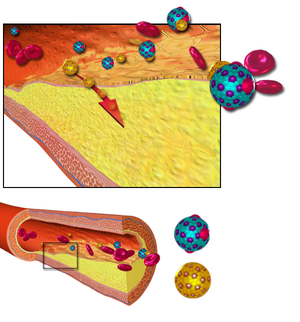 ^ a b c d e "How Is Atherosclerosis Diagnosed? - NHLBI, NIH". www.nhlbi.nih.gov. Retrieved 2015-06-19. ^ a b "ACE inhibitors: MedlinePlus Medical Encyclopedia". www.nlm.nih.gov. Retrieved 2015-06-19. ^ "Atherosclerosis". PubMed Health Glossary. ^ Rubin, Raphael; Strayer, David S.; Rubin, Emanuel (2011-02-01). Rubin's Pathology: Clinicopathologic Foundations of Medicine. Lippincott Williams & Wilkins. ISBN 9781605479682. ^ Insull, William (2009). "The Pathology of Atherosclerosis: Plaque Development and Plaque Responses to Medical Treatment". The American Journal of Medicine. 122 (1 Suppl): S3–S14. doi:10.1016/j.amjmed.2008.10.013. PMID 19110086. ^ Diehm, C.; Allenberg, J.-R.; Nimura-Eckert, K.; Veith, F. J. (2013-11-11). Color Atlas of Vascular Diseases. Springer Science & Business Media. ISBN 9783662062876. ^ "Atherosclerosis: MedlinePlus". www.nlm.nih.gov. Retrieved 2015-06-19. ^ Mohan, Harsh (2012-11-30). Pathology Practical Book. JP Medical Ltd. ISBN 9789350902660. ^ "hyperplastic arteriosclerosis". Retrieved 2015-06-19. ^ "hyaline arteriolosclerosis". Retrieved 2015-06-19. ^ "Angioplasty: MedlinePlus". www.nlm.nih.gov. Retrieved 2015-06-19. ^ "Coronary artery bypass surgery". MedlinePlus. ^ "Atherosclerosis -Treatment". UK NHS. Retrieved 21 November 2013. ^ "Thrombolytic therapy: MedlinePlus Medical Encyclopedia". www.nlm.nih.gov. Retrieved 2015-06-19. ^ "Atherosclerosis". Merck Manuals. Retrieved 13 February 2015. ^ Mayerl, Christina; Lukasser, Melanie; Sedivy, Roland; Niederegger, Harald; Seiler, Ruediger; Wick, Georg (2006). "Atherosclerosis research from past to present—on the track of two pathologists with opposing views, Carl von Rokitansky and Rudolf Virchow". Virchows Archiv. 449 (1): 96–103. doi:10.1007/s00428-006-0176-7. PMID 16612625. ^ Copstead-Kirkhorn, Lee-Ellen C.; Banasik, Jacquelyn L. (2014-06-25). Pathophysiology. Elsevier Health Sciences. p. 322. ISBN 9780323293174. Retrieved 25 July 2016. Lusis, Aldons J; Mar, Rebecca; Pajukanta, Päivi (2004). "Genetics of Atherosclerosis". Annual Review of Genomics and Human Genetics. 5: 189–218. doi:10.1146/annurev.genom.5.061903.175930. PMC 3362664. PMID 15485348.